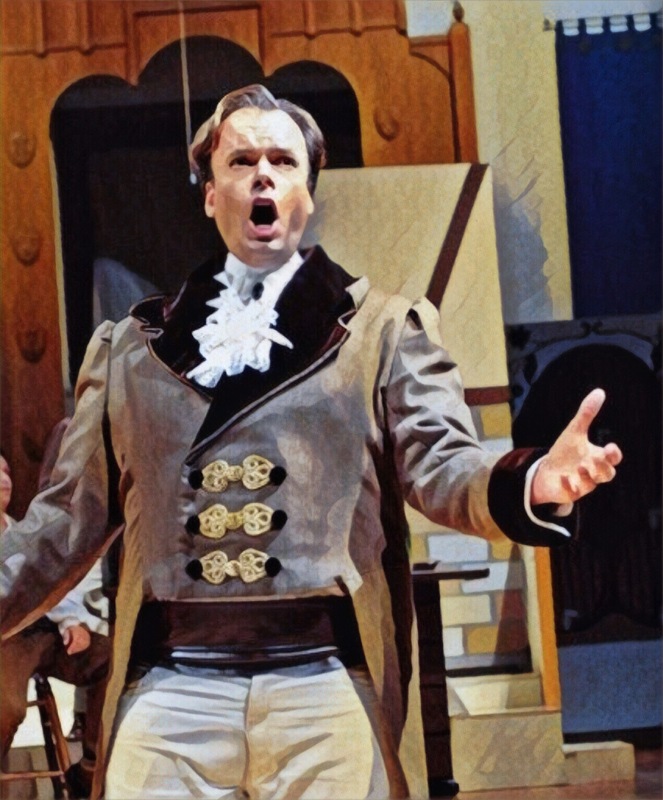 Christopher Anderson-West is a 6’4″, Full Lyric Tenor. After having been discovered by a voice teacher while pursuing a career as a singer/songwriter in his twenties, Christopher went on to receive a wonderful education at the San Francisco Conservatory of Music. Christopher has had the pleasure of performing in the San Francisco Bay Area, Los Angeles (LA Opera), Washington DC, Boston, Italy, England, China, France and Germany. Favorite roles performed are Mario Cavaradossi in Puccini’s tragedy “Tosca”, Hoffmann in Offenbach’s “The Tales of Hoffmann”, Don Jose in Bizet’s “Carmen”, Il Duca di Mantova in Verdi’s “Rigoletto” and Tsar Berendey in the United States Premiere of Rimsky-Korsakov’s “Snegurochka”. Upcoming for Christopher is Rodolfo in Puccini’s beloved “La Boheme”. First audition results of the new season are in! I will be finishing the year with the lush beauty of La Boheme this December, as Rodolfo. First opera role in for next season will be a reprisal of one of my favorite roles: Hoffmann in Offenbach’s intoxicating dreamscape of an opera, “Les Contes d’Hoffmann” (The Tales of Hoffmann). I look forward to discovering what other characters I will be portraying/singing in the upcoming year. Have a happy holiday season! The stars were shining, And the earth was scented. Fragrant, she entered And fell into my arms. While feverishly I stripped the beautiful form of its veils! That moment has fled, and I die in desperation. And I die in desperation! And I never before loved life so much, Loved life so much! Singing the middle section of the Kleinzach aria. One more performance this Saturday with Repertory Opera Company as Hoffmann in Offenbach’s The Tales of Hoffman! I have loved singing this role … the music is stunning. Since I will be singing the role of Hoffmann, in Offenbach’s “The Tales of Hoffmann”, for Repertory Opera Company this June AND since Vittorio Grigolo is singing Hoffmann for Los Angeles Opera’s current production … I am looking forward to getting coached on the Kleinzach aria by a star currently doing the role! I have greatly enjoyed being a part of Peter Mark’s Master Class series this winter. There have been new and difficult lessons … but that is always the case when honing one’s skills and advancing. You fall down and get back up, moving ever onward. As a result I feel like my technique is finally approaching a level that I would call “beautiful singing” … the kind of singing that is nuanced and luxurious. We are our own worse critics, so it is exciting to me to actually feel that way. Now, of course, it is time to get that embodied so it becomes completely natural. Fortunately I have the perfect opera lined up to help me along that path toward technical embodiment … Offenbach’s “The Tales of Hoffmann” in June! For now, my focus is on this weekend. We will be singing in front of a panel featuring music professionals from Los Angeles Opera, San Diego Opera, Long Beach Opera, KUSC and more. I will be singing “Donna non vidi mai” from Puccini’s “Manon Lescaut”. First is Don Ottavio, from Mozart’s “Don Giovanni”. Second will be Nemorino in a concert version of Donizetti’s “Lelisir d’amore”. Lastly, I will be taking on the title role of Hoffmann in Offenbach’s “Les contes d’Hoffmann”. LOTS of music to begin memorizing as these are all new roles for me. Grateful to be singing and making money for it! Looking forward to performing a secondary role with Pacific Opera Project in their upcoming production of Rossini’s “The Barber of Seville”. After a busy summer of singing Don Jose in Bizet’s masterpiece “Carmen”, filling in as a last minute Alfredo Germont for a company in need of a tenor for Verdi’s “La Traviata” and then taking part in a wonderful series of master classes in Beverly Hills with Maestro Peter Mark … Christopher is very much looking forward to the fun and hilarity that has been every POP production he has been involved in. To set up this clip, Maestro Mark had asked me to walk around to get my legs and core engaged. In terms of the high C’s, the Maestro talked about the importance of “exploding”, or creating a wind tunnel, backwards on the lower note directly preceding. You can hear how I successfully did this on the first four high C’s, but then the second set of four I did not and the C’s were thinner and not as solid. The Maestro stops me and motions (off camera) backwards out the back of his head on the lower note. Once I corrected off this instruction the last three high C’s were solid again. Continuing to work on the the sustained High C with various arias. It feels so great to have had the breakthrough where this feels relatively easy to me now.